This is Garlic Mashed Potatoes and Baked Potatoes in a Crock-Pot® Slow Cooker, sponsored by the Crock-Pot® brand. All opinions are mine alone. Let’s talk about my love of all things potato. It’s a serious thing. And by the end of this post, you’ll see why. Your life will never be the same after making these Crock-Pot® Garlic Mashed Potatoes and Baked Potatoes using a slow cooker. It’s no secret that I have a strong love for my Crock-Pot® Slow Cooker. I have talked about it over and over because it has saved me so many times. Not only am I able to make amazing meals, but I can throw a bunch of ingredients in and go about my busy day. I use it a lot in the summer because I don’t want to turn on my oven to heat up an already hot house. But fall is also an awesome time to use your slow cooker to cook seasonal recipes. I’ve got two easy and out of the box ideas for you to try this season. 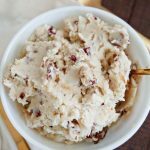 Let me present to you – garlic mashed potatoes and how to make baked potatoes in the slow cooker. Once you try this way, you’ll never go back!! These garlic mashed potatoes taste really similar to those from a couple of my favorite local restaurants. And honestly, I go to those restaurants because I love the mashed potatoes. My whole family gave these mashed potatoes two thumbs way up. They were divine. And the only way I want to make mashed potatoes from here on out. 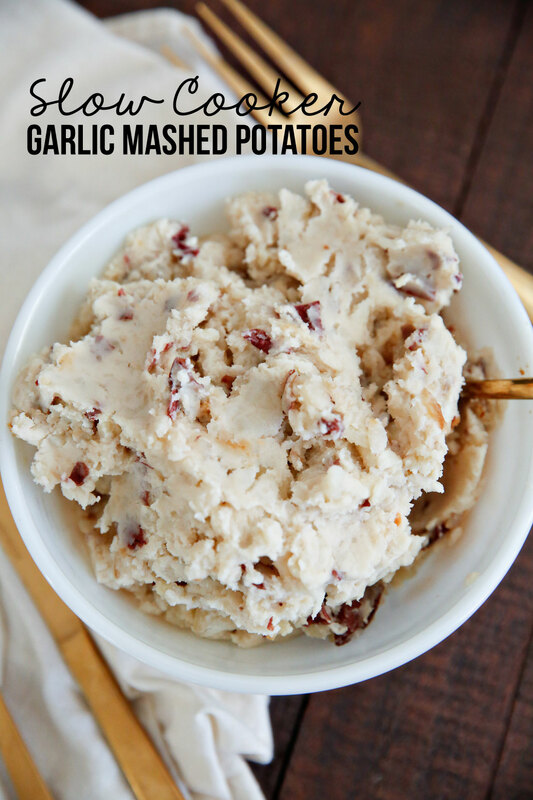 Your life will never be the same after making these Slow Cooker Garlic Mashed Potatoes using a slow cooker - they are amazing!! 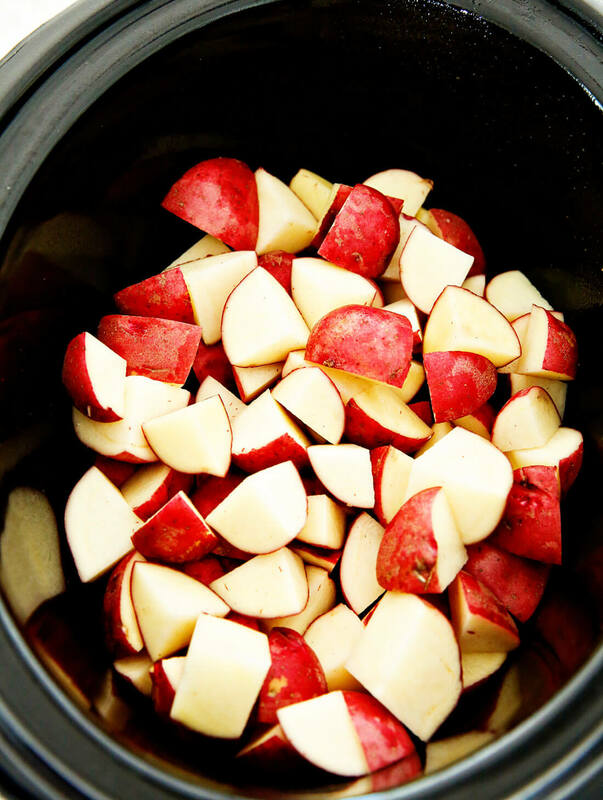 Add chopped potatoes and cook on high for 3 hours on low or 6 hours (time may vary depending on type of slow cooker). After potatoes are cooked (should be able to smash them with your fork easily), add in butter, sour cream, cream, garlic, salt and pepper. 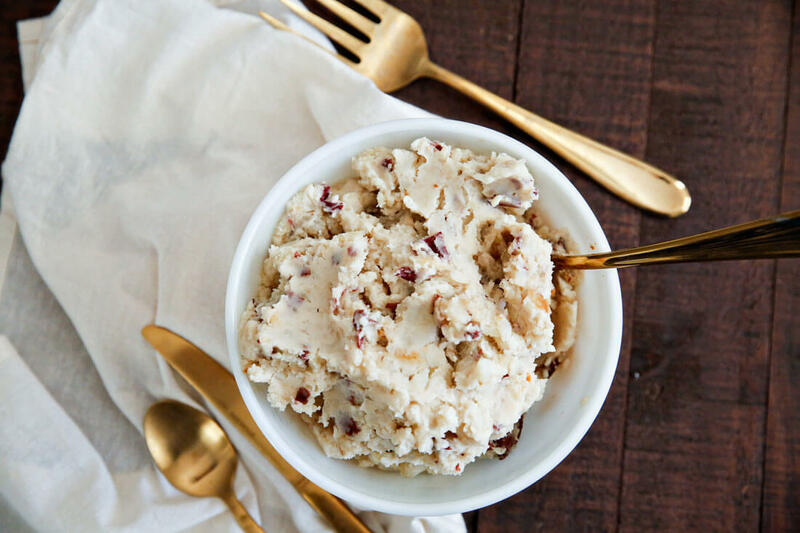 Use a hand mixer to mash potatoes and other ingredients. If you want to take them a step further, you could add shredded cheddar cheese. Mmmmm!! 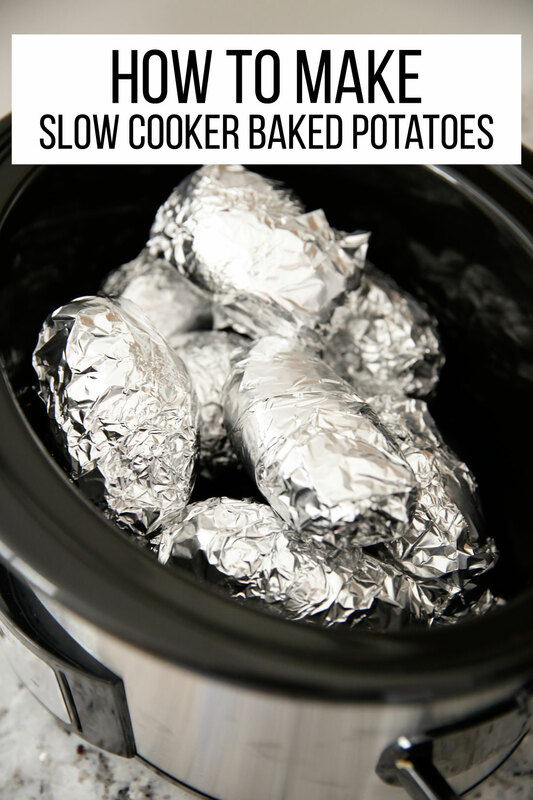 While we’re on the subject of potatoes, why not make some baked potatoes in the Crock-Pot® Slow Cooker too? If you’ve read 30days for a while, you might have heard me mention that I lived off baked potatoes and penne pasta when I was in college. I didn’t know how to cook but I could bake a potato. So several days a week that’s what I made for myself for dinner. At the time I didn’t have a Crock-Pot® Slow Cooker but have since had a few. Much like making them in the oven, they are so easy and oh so good! I love the Crock-Pot® 6-Quart Programmable Cook & Carry™ Slow Cooker. I like that I can lock the lid in place after I use it and bring it with me to parties or family dinners. I also like that I can set the timer and then it switches to warm after it’s done cooking. 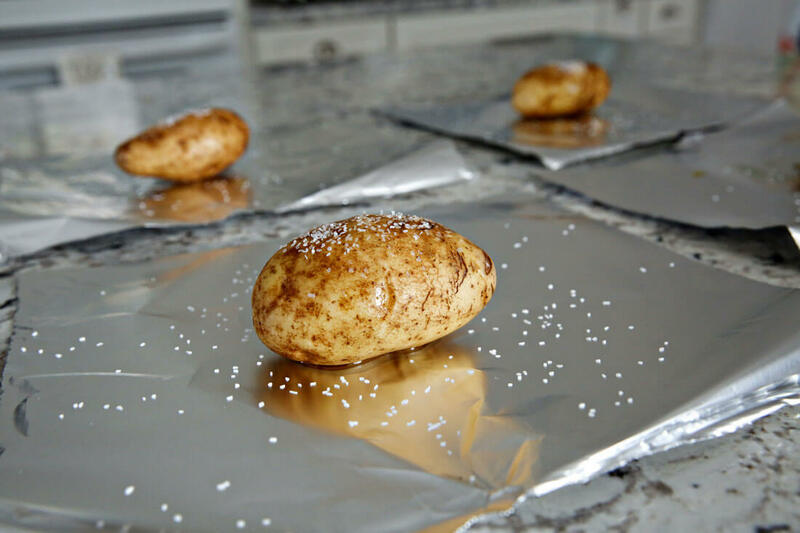 After washing the potatoes, you will then sprinkle them with kosher salt and a drizzle of olive oil and roll them up in aluminum foil. Then you place them in the slow cooker. Easy as that! 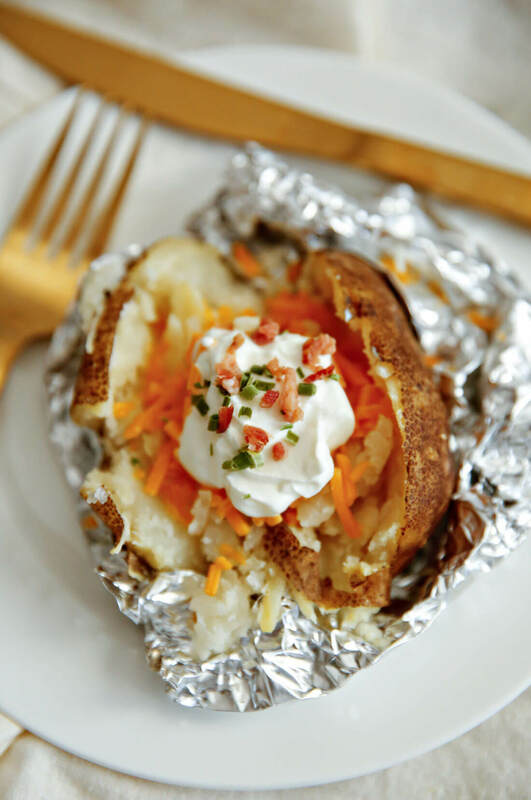 Tear off a piece of aluminum foil for each potato. Place pierced potato in the middle of the tin foil. Drizzle with olive oil and sprinkle with salt. 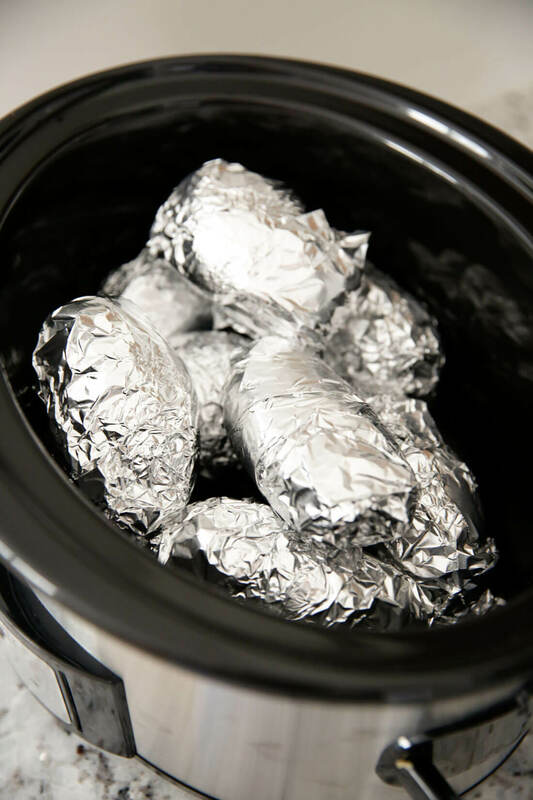 Wrap each potato up with foil. Place in the slow cooker and cover. Cook on high for 4 1/2 – 5 hours or low for 7 1/2-8 hours. 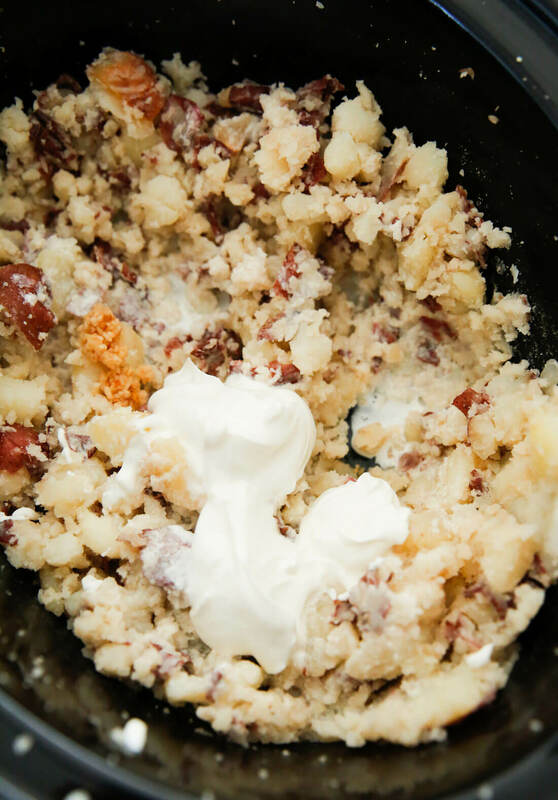 With baked potatoes, my family members can add whatever they want for toppings – butter, sour cream, shredded cheese, chili, onions, chives, bacon, etc. There’s no fighting over not liking something because they make it however they want. Then everyone is happy! While I use my slow cooker for recipes like Chicken Tortilla Soup, I love that I can use it for unconventional things like baked or mashed potatoes. 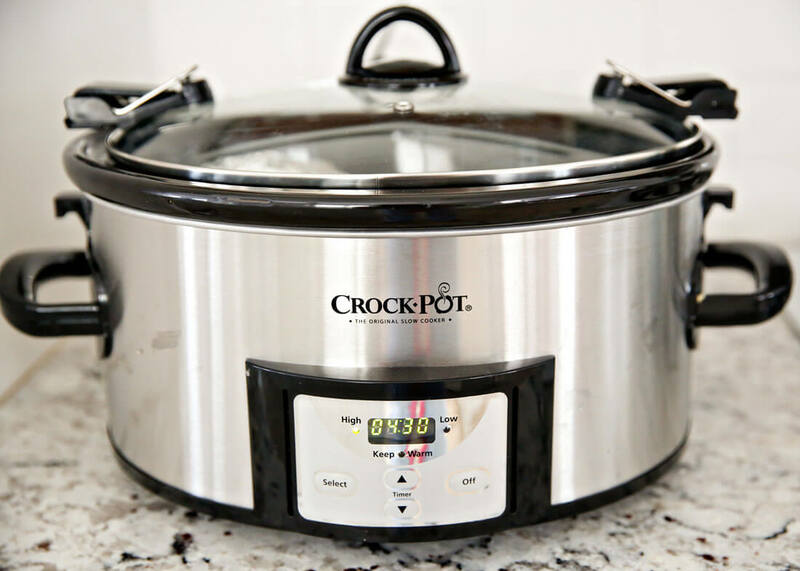 Enter to win a Crock-Pot® 6-Quart Programmable Cook & Carry™ Slow Cooker! Note: Sometimes it takes a second for the giveaway widget to load. Looks yummy and perfect solution for the busy holiday season. 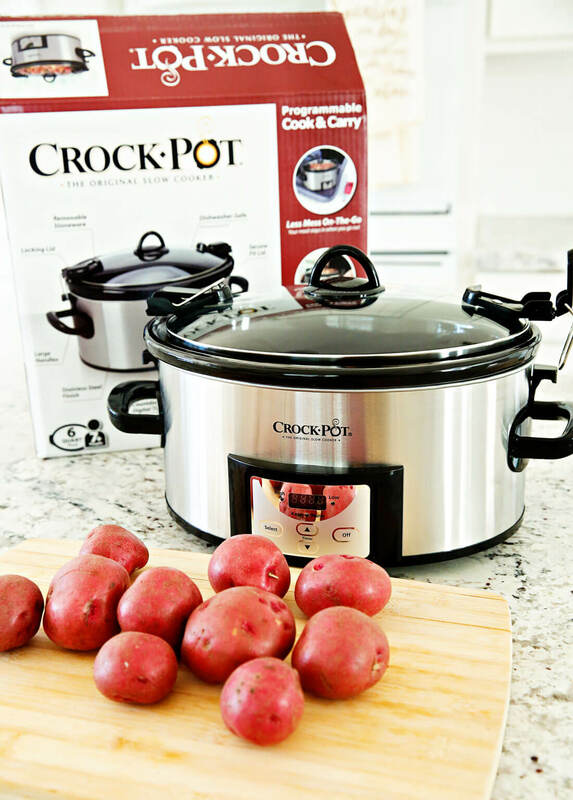 Hi Jennifer – in the recipe it says “cook on high for 3 hours on low or 6 hours.” Because it’s in a slow cooker, you will need to check on the potatoes around that time to make sure they are fork tender and then add other ingredients and mash. Hi Terri – no you don’t need to add water.